University of Notre Dame researchers were involved in two of the Top Ten Breakthroughs of 2012 announced today by Physics World magazine. 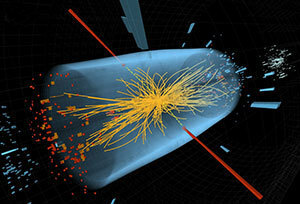 The Higgs-like boson discovery was No. 1 on the list, and the BaBar experiment, the first direct observation of time reversal violation, was No. 3. Professor of physics Colin Jessop, Research Assistant Professor Nancy Marinelli, and graduate students Doug Berry and Ted Kolberg contributed to the Higgs-like discovery at CERN earlier this year. Jessop, Professor of Physics John LoSecco, postdoctoral associate Wenfeng Wang and graduate student Kyle Knoepfel were on the BaBar team that published “Observation of Time-Reversal Violation in the B0 Meson System” in Physical Review Letters last month. Physics World reviewed more than 350 of the articles that it published in 2012 to select the breakthroughs, based on the fundamental importance of the research, the significant advance in knowledge it provided, its strong connection between theory and experiment and its general interest to all physicists. Other cited research involved Majorana fermions, particles that are their own antiparticles; galaxy-cluster motion; viewing fluorescent objects behind opaque barriers; the first maser that operates at room temperature; measuring the tiny amount of heat released when an individual bit of data is erased; a new technique for entangling photons using orbital angular momentum; the first demonstration of communications using neutrinos; and a new system that converts kinetic energy into chemical energy in a single step. Originally published by Gene Stowe at newsinfo.nd.edu on December 14, 2012.